Alyssa Crittenden with Hadza children, Tanzania. Photo courtesy of Alyssa Crittenden. Alyssa Crittenden is an assistant professor of Anthropology at the University of Nevada, Las Vegas. To be more specific, Alyssa is a behavioural ecologist and nutritional anthropologist who works among the Hadza hunter-gatherers in East Africa. Professor Crittenden’s work is inter-disciplinary, including anthropology, ecology, nutrition and human biology, with a primary focus on the evolution of human behaviours as adaptive solutions and placing them in a sociological and ecological context. The Hadza live near Lake Eyasi in Tanzania. They are the last remaining tribe on the whole of the African continent to forage for the majority of their diet. Much of Professor Crittenden’s work has centred on spending time with the Hadza in order to gain an increased understanding of the hunter-gatherer life as well as shedding some light on broader questions of human behaviour and human evolution. 2015: Hadza Dental Microwear: Implications for the evolution of human diet. 2013: Testing the Cooking Hypothesis: the nutrient availability of cooked versus raw tubers. 2013: Characterizing the Hadza gut microbiome. 2011-2012: Cross-cultural Studies in Cognition. 2005: Oldowan Use-wear Experiments and Analysis: Wild tuber processing by Hadza women. the evolution of cooperative breeding in humans. Alyssa Crittenden with Hadza women during fieldwork in Tanzania. Photo courtesy of Alyssa Crittenden. In particular I was interested to speak with Alyssa about her work on the evolution of the human diet, foraging and food sharing strategies, including her hypothesis about the importance of honey consumption in the human evolution. Click here to read or download the transcript of Paul Kirtley Podcast episode 010. Alyssa with Hadza children. Photo Courtesy of Alyssa Crittenden. 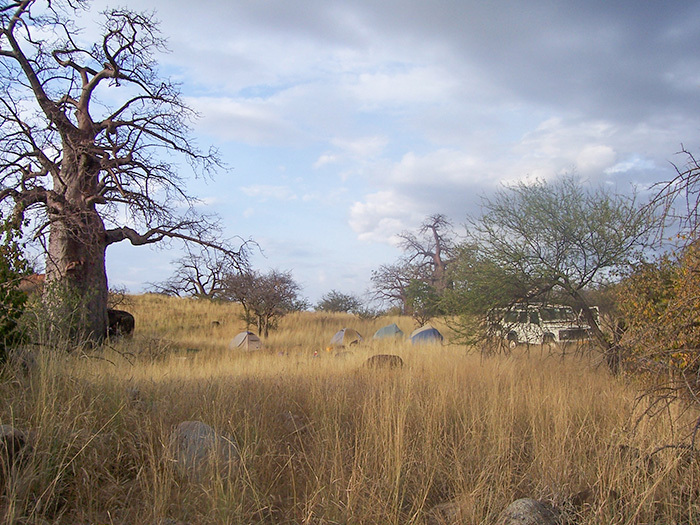 Alyssa’s camp during field work in Tanzania. Photo: Alyssa Crittenden. And Finally…May I Ask A Favour? Scientists as she deserves special praise. I am happy that I was able to meet with the life of Hadza people. Glad you enjoyed it Bozidar. Just really wanted to give a big thumbs up to this podcast (and all the others). Really interesting and informative. Keep it up (when you can find the time). P.S Thanks for all of the knowledge sharing you do, it is appreciated. Thanks for the feedback and words of appreciation Matt. It means a lot. Great podcast! Your interviewee was most interesting and inspiring, as are the subjects of her research. I’ll definitely be looking for more related information. It was also very helpful to be able to read the transcript as I had a bit of trouble listening on my device (chromebook) so I could fill in any gaps and re-read. Nice to hear from you. It’s been a while. Thanks for your feedback on this episode as well as the usefulness of the transcript. Incredibly refreshing to hear someone like Alyssa speaking about such intellectual but relevant source material within the context of a bushcraft-related podcast. There are so many survivalist macho types tramping around claiming they do bushcraft, but your genuine interest in learning the accumulated wisdom of hunter-gatherer peoples and your gentle, considered, intellectual approach to bushcraft is greatly appreciated by the likes of me and I’m sure many others. Keep it up Paul, and thanks to Alyssa. Your appreciation of what I’m attempting with this podcast is greatly appreciated. I am now eating honey in the morning with butter and full-fat milk, and baobab powder, and will eat nothing till much later in the day, where after walking many thousands of steps I will consume meat rich dish with tubers, and berries, nuts. I am sure my distended abdomen will disappear quite fast. This is the future of the Western diet, it has to be! This was one of the most enjoyable podcast to date! One of my favorite subjects! This was an awesome podcast and extremely interesting. Thank you so much for making this sort of information available and also in such a relaxed and easy to listen to conversation, its great!!! Hope I don’t get banned but…..
Rather upsetting podcast to say the least. I could go into detail but I don’t won’t to spoil your day. Maybe she should get them to stick a mobile phone mast on whats left of their land to get that twittering started. it would give them some income too. I would be happy to clarify my views further if tolerated. Maybe by email. No disrespect to you Paul, as I feel you truly are sympathetic to the bushmens plight. Have you seen the film, the gods must be crazy? Your anthropology girl should watch it. Why would you be banned? I have no firm clue as to what you are alluding. I suggest you send an email to elaborate on your issues with this podcast and/or Professor Crittenden’s views. The contact form is easy to find on this site. Drop me message that way. Really fascinating – thank you! I read about the Hadza the other day, and then saw them mentioned in M Mosley’s ‘Clever Guts’ book. I spent time camping out bush in northern Australia, and was fascinated by the lifestyle of the remote communities. Even when visiting Darwin city the Aboriginal people still forage for fish, crabs, fruits, berries and ‘Longbums’ – a crustacean. I went to sit with a group in the local mangroves once and tried these slimy worm-like things, cooked on a small open fire next to a big highway! – Really tasty and nutritious. I am really interested in diet and gut health having healed late-stage Lyme disease by focusing on nutrition and gut health. I can’t wait to learn more! Alyssa said, “We didn’t even really know about the Hadza. The Hadza didn’t even show up in Tanzanian registries or in history books until the turn of the last century. And part of that is because they were living in the interior of Northern Tanzania in a very remote area of the bush near Lake Eyasi directly.” In Northern Canada, the Innu were virtually unaffected by modern civilization until after WW2, and during the Cold War, ‘civilized’ NATO troops went up there to hold the “Dew Line” against invasion from the USSR. With Nato troops came the introduction of Coke Cola, candy bars, and radios, which negatively affected the Innu. The Elders of these people have since struggled to restore their social structure and nomadic way of life, but civilized governments restrict these people to ‘traditional events’ and touristic attractions. “Come hear their drums.” “Hey! Let’s film how they did that, for posterity’s sake”. You get the picture. Our notion of civilization is freeze-dried food and synthetic everything, to vacations in exotic locales to escape the seasonal discomforts which our ancestors just accepted as life in the area. Sorry for the rant. It seems bushcraft is the answer that respects traditional methods and ancient ways, but too many are concerned with selling convenient products to make a quick profit. And, convenience is what ‘civilization’ is all about. The Hadza are successful because they reject our civilization. Good for them!